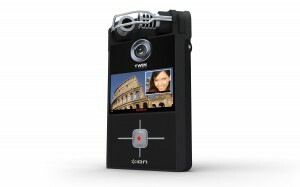 Ion Audio plans to release the Ion Twin Video in Q2 of 2010. This little “wonder-cam” shoots and records from 2 cameras on opposite sides. That way, you can shoot the all important “action – re-action” with one camera. The target audience is YouTube, but I see this as the VJ camera of the future. Specs are hard to come by, but it will probably include stereo microphones, live editing on the camera itself, and SD card storage.